The 2016 Hawaiian Airlines Liberty Challenge featured the Polynesian Voyaging Society’s canoe Hōkūle’a at Hudson River Park’s Pier 26. New York Outrigger was honored to host the Polynesian Voyaging Society’s sailing canoe Hōkūle’a at the 2016 Hawaiian Airlines Liberty Challenge. The Liberty Challenge officially opened on Thursday, June 9, with the Hōkūle’a Storytellers’ Evening at Patagonia Soho. The event was free and open to the public. On Saturday, June 11, the voyaging canoe offered dockside tours at Hudson River Park’s Pier 26, and crewmembers from the Mālama Honua Worldwide Voyage provided educational programming at the Liberty festival. Everyone was invited to the free public festival to celebrate Hōkūle’a’s arrival in New York City. The Hawaiian Airlines Liberty Challenge festival was held at Hudson River Park’s Pier 26 on Saturday, June 11, from 10am until 5pm. 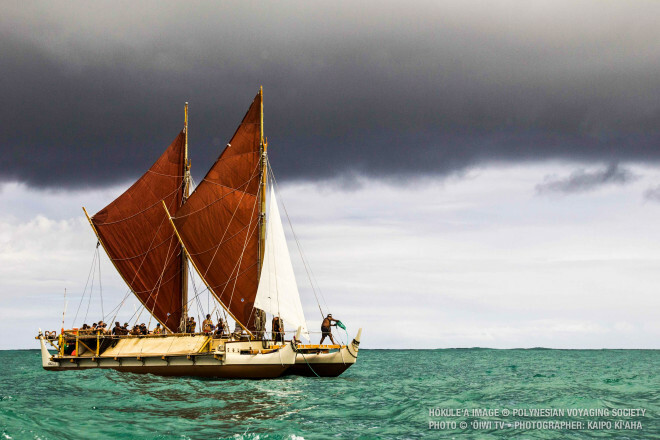 Now in its third year, the Mālama Honua Voyage will take the crew of the Hōkūle’a around the globe. Mālama Honua means “to care for our earth” and the mission of the voyage is to share, learn and create global relationships that bridge traditional and new technologies to help our world live more sustainability. The Polynesian Voyaging Society first launched Hōkūle’a in 1975 with the goal of proving that the people of Polynesia could have successfully voyaged to the islands of Hawai’i. Founded on a legacy of Pacific Ocean exploration, the Polynesian Voyaging Society seeks to perpetuate the art and science of traditional Polynesian voyaging and the spirit of exploration through experiential educational programs that inspire students and their communities to respect and care for themselves and each other, and their natural and cultural environments.